Bob's Blog: Another reason why it is crucial to elect people who will protect religious liberty! Another reason why it is crucial to elect people who will protect religious liberty! Several were laborers like George Washington Farmer and William Lee–one white, the other African-American. One, Ernest Pendleton Magruder, was a well-known surgeon. Another, Henry Lewis Hulbert, a Medal of Honor recipient of a previous war, would again display such bravery that he would earn a Distinguished Service Cross. 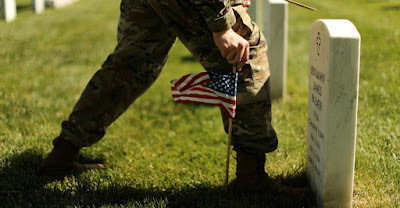 Educated or not, white or black, rich or poor, diverse backgrounds mattered little as they died on foreign soil in the final months of the “war to end all wars.” Their bodies were interred under small grave markers, including crosses, in cemeteries far too distant for their families to ever visit. So, in 1925, a local post of The American Legion—now the largest veterans service organization in the country with approximately 2.2 million members—erected the Bladensburg World War I Veterans Memorial to honor the 49 Bladensburg-area men who gave their lives serving in the U.S. Armed Forces during WWI. On behalf of The American Legion, my firm, First Liberty Institute and our network attorneys at the international law firm Jones Day, appealed that ruling to the U.S. Supreme Court. Last Friday, the justices announced that they will hear the appeal. If this memorial is desecrated or bulldozed to the ground, it’s only a matter of time before the wrecking ball turns on the two World War I crosses in Arlington National Cemetery and the perhaps hundreds of other memorials across the country. Such an outcome would be tragic not only for the families of those honored, but for our nation as well. This Sunday, Nov. 11, marks the 100th anniversary of the Armistice, the official end of WWI. Perhaps many Americans are unaware of what happened at the eleventh hour of the eleventh day of the eleventh month, other than to know it’s Veteran’s Day. Such is the case in our history-challenged culture. But the mere fact that Americans have forgotten our history is precisely why memorials like Bladensburg must be preserved: we forget what we do not see. Forget you? No, we never will. The Gold-Star Mothers and The American Legion who erected the Bladensburg WWI Veterans Memorial to the 49 sons of Prince George’s County did so knowing that we would forget the service of their sons and husbands unless the living honored their sacrifice. The U.S. Supreme Court is the last hope for the preserving the Bladensburg WWI Veterans Memorial, ensuring we will be able to continue to remember the valor, endurance, courage, and devotion of the boys of Bladensburg.